Sugru Review - The Wonder Stuff! It’s that time of year when Christmas has wreaked havoc on your bank balance, your social life has become non-existent, the weather is getting even colder and you’re supposed to be going to the gym three times a week – many call it the January blues. On the other hand, the New Year is a time for making plans, booking holidays, saving money and getting jobs around the house done that have kept being put off. Nothing can help you beat those January blues more than putting some money back in your pockets and making you feel good about yourself, and your home. 0800 HANDYMAN, one of the largest professional handyman services in London provides a team of qualified handymen to help householders, landlords and businesses deal with the all those little jobs that for all sorts of reasons never seem to get done. Get a Boiler check-up – Full-blown boiler problems can often develop from minor faults. An annual service will increase the chance that these are picked up on and fixed before they become a problem, saving you money and future hassle. The engineer who undertakes your annual boiler service will make sure that it is running as efficiently as possible. This will also go a long way towards making sure that you minimise your heating bills. Seal up small holes – Use a can of spray foam to seal up any holes in the walls, window sills, as well as in the floor of the attic to help prevent heated air from escaping and cold from intruding. Use The Timer Delay on Your Dishwasher and Laundry Appliances – Run your loads after 8 p.m. (But always be sure to finish the cycle before you turn in for the night—in case of a short that could result in a fire.) Though they don’t always promote it, many utilities offer cheaper off-peak pricing for electricity—to the tune of a 50 percent discount or more. Paint or Decorate – In colder climates it’s actually an ideal time to paint. 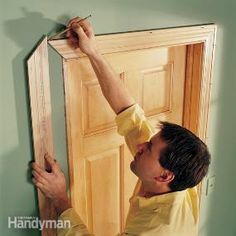 You won’t need as many touch-ups later because the cold, dry air causes the wood in mouldings to shrink and gaps to appear, so he can caulk to fill them. Since the painter is probably looking for work, you could get price cut and a quicker turnaround. Stop a crack in its tracks – Fix a crack in a plaster wall before it branches out and causes large sections of wall or ceiling to delaminate or pull away. Sorting it now will save money in the long run from costly long term repair work. Address a Leaky Toilet Immediately – Repair a leaky toilet if you spot moisture on the floor underneath it. What seems like a drip could indicate a serious leak in the progress as the water pools beneath the subfloor, which could cause the ceiling to collapse onto the floor below. To make an enquiry or booking with 0800 HANDYMAN, please telephone; 0800 426396 or refer to the website at www.0800handyman.com.